My skin is generally dry but it gets worse during the winter season it tends to get worse. I usually put on lotion as soon as I get out of the shower. I love LUSH products and I was in need of something that would give my skin the moisture. Through reading reviews prior to going to LUSH I found that many loved the You've Been Mangoed Bath Melt. I decided to try it out. This bath melt is $6.25 CDN. It's about half a deck of cards size and thickness. 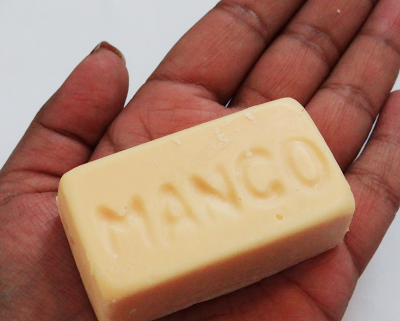 "You've Been Mangoed is a bright and breezy citrus perk-me-up bath melt, loaded with nutritious mango and avocado butters to condition and moisturize the skin. One of the zingiest, most invigorating scents in all of LUSH, its unmistakable fruity fragrance comes from skin toning lemon and lime essential oils, with just a drop or two of invigorating lemongrass to really get things going. Perfect for early morning soaks in the tub, the scent will keep you in a good mood all day long. To start your day out right, get Mangoed." This melts from your body heat so I keep it in the bag until I'm ready to use it and I leave it in a cool place. I've cut up this into small pieces so that I can get multiple uses out of it. While I'm in the shower I rub this onto my body and it melts into my skin. It leaves my skin moisturizing and smooth. It doesn't smell like Mango it's more of a citrus scent with lemons. But I love it nonetheless. I'll definitely repurchase this again. It is a bit pricey for such a small piece but I'm addicted to the smell. Have you tried this? What do you use to keep your body moisturized?